Pass this test in handwriting. 1. Write a letter on a subject given verbally 5 minutes previously. 2. Demonstrate a knowledge of the different methods of posting items and their cost. 3. Produce an item of calligraphy using ink and an italic nib (or similar). This needs to show only a beginner’s skill. 4. Copy or design an illustrated letter (such as those in an old manuscript). 5. 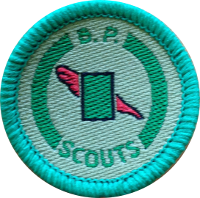 Write a satisfactory report of a troop Camp, meeting or other Scout event.